Does your baby get overly fussy when you try to put them down? All newborns need to be held, but sometimes this “need” can become more of a habit. If you’ve reached the point where your little one is constantly wanting to be held and cries every time you put them down, don’t worry. 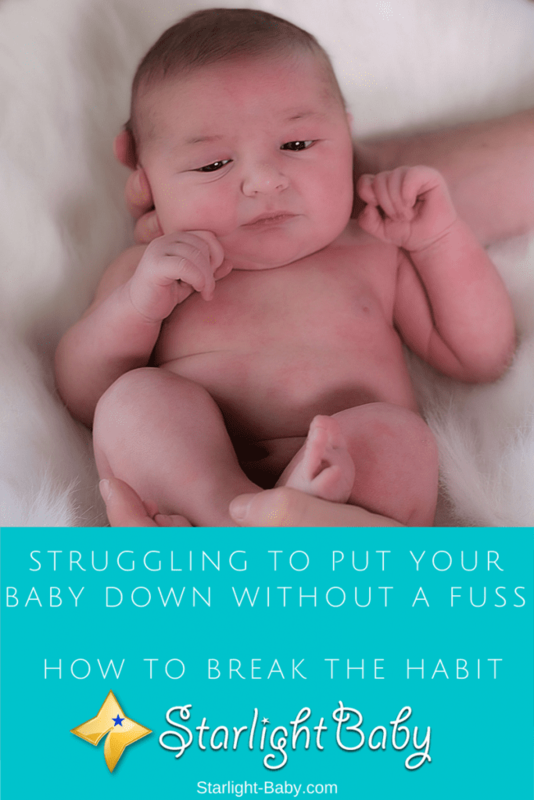 There are ways to break this habit, but as with any baby parenting issue, it’s going to take time and patience to get through it! Click here to download a printable bonus checklist and PDF copy of this post! It can be baffling for new parents to understand why their infant is refusing to be placed down in their bassinet or crib without a fuss. However, if you put yourself in your little one’s shoes, they spent nine months safe and snug in the womb. Now suddenly, they’re out in the big wide world and while the crib or bassinet may seem small to you, compared to being tucked up in the womb it’s actually really huge to your baby. All babies are different and some find it a lot scarier than others to be placed into such a wide-open space alone. Therefore, they get upset and scared when it happens. Babies need a lot of reassurance, love and affection in the first few months and that need won’t just magically disappear if you need to do something. One of the most common concerns parents have is that their baby is making a fuss because they have become reliant upon the attention. So, is it possible your little one has developed attention-seeking crying behavior? Will Picking Them Up When They Cry Make The Problem Worse? Up until the age of 4 months, your little one doesn’t really understand the crying for attention theory. Therefore, if your baby is still in the early infant stages, it’s highly unlikely you have helped them develop an emotional attachment issue. Instead, it’s simply a natural reaction and a genuine need. It’s around the age of 2-4 months where they start realizing that they are completely separate to mom. At this time, they cannot use their memory to recall the times that they have been left in the crib and you have returned. So, every time they are placed down, they have no idea when, or if, you’re coming back. That’s a very scary thing for a baby! With this in mind, picking them up again when they do make a fuss will not make the problem worse. It’s only after they reach 4-6 months that they start to learn about crying for attention. So, don’t feel you have to let them cry it out and ignore them because the truth is, that could simply just cause further unnecessary upset for both of you. So, if you shouldn’t just leave them to cry, what should you do? Well, the good news is there are ways to make it easier on you and baby and we’ll look into some of them below. Try To Make The Crib Interesting – Baby mobiles are a fantastic invention and can really help to distract your little one. It’s a good idea to invest in a few different mobiles that you can switch occasionally to keep it varied. Try ones which play lullabies, make noises or project different colors and shapes onto the ceiling. These are great for when you really need to get a few chores done. The Swaddle Technique – Swaddling is one of the most effective ways to soothe a baby and it’s especially useful for this particularly issue. Remember we said the main reason babies fuss when you put them down is because they find it scary being in such a wide-open space? Well, swaddling helps them to feel safe and snug and mimics the way they felt in the womb. Some parents do worry about placing a swaddled baby in a crib. However, as long as you frequently check on your little one, lay them on their back, and the swaddle isn’t loose, it’s usually safe to do. You can always talk to your pediatrician first to get advice and ensure you know the proper technique before trying it out. Add A Little Noise – It’s a common mistake to try and make the house as quiet as possible when you’re putting baby down for a nap. As adults, we typically need it to be quiet before we can fall asleep. Your baby on the other hand is actually used to hearing a lot of noise before they drift off. Did you know that the sound of the womb is estimated to be as loud as a lawnmower? That’s why it’s often recommended you add white noise to the room, or try placing the bassinet near the washing machine or tumble dryer. You may just be surprised by how soothing noise is for your baby when they’re alone in their crib or bassinet. You may also consider investing in a white noise machine – click here to learn more about white noise for babies. Try Using A Swing Or Bouncy Seat – If you’re just looking to put baby down while you take care of a few things, a swing or bouncy seat can be a great distraction. Babies love the motion of a baby swing and will usually happily entertain themselves for a short amount of time while you take care of a few chores. Invest In A Front Baby Carrier – The easiest way to keep baby happy while you get things done is to keep them close. A front baby carrier is a fantastic investment. Your baby will still be with you, but you’ll also have the freedom to use your arms to do things. You will even find your little one happily drifts off while they’re in the front baby carrier. So, there you have it, some of the best tips for soothing a fussy baby who doesn’t like to be put down. It’s also worth keeping in mind that some babies do suffer from reflux issues, which makes it uncomfortable for them when they are placed down. So, it is worth visiting the doctor to establish whether this could be the problem rather than a natural need for attention. Overall, it can be frustrating and confusing, but if your little one is under 4 months of age, keeping them with you isn’t going to cause any attention seeking behavior so don’t be afraid to hold them often. Have you experienced this issue and have your own tips that worked wonders? Do us all a favor and share them below! All your tips are very useful, for instance, I didn’t know that until the age of 4 months our baby doesn’t cry to get attention. Adding the noise can be a solution to make our baby get used to the noise and not cry very much when there is no noise. Thanks for sharing, this will make our days quite. Yes, this is a really informative article that gives parents a perspective on why babies most often do not want to be put down. Great to know it has helped you, too! Maybe I am a lazy parent, however, when the baby goes fussy and cannot be put down,I will play baby rhymes on my phone and let the baby watch the rhymes until he is tired. Once he feels tired, it is easier to put him down. My wife feeds from her brest to calm the baby. Both of these techniques work for us. Thank you for sharing your baby-soothing tips, vinaya. Great to hear! Nursery rhyme songs do catch attention and could calm babies. Same goes for breastfeeding. They do tend to fall asleep while breastfeeding. Enter your first name and best email to receive a printable checklist and PDF copy of this post!